The Arabian Desert is a desert in Asia. 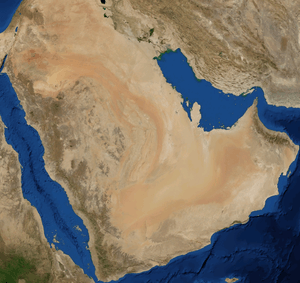 It is on most of the Arabian Peninsula. It covers 2,330,000 square kilometres (900,000 square miles). The ethnic group is that of the Arabs. Map of the Arabian Desert. Ecoregions as delineated by the WWF. Satellite image from NASA. 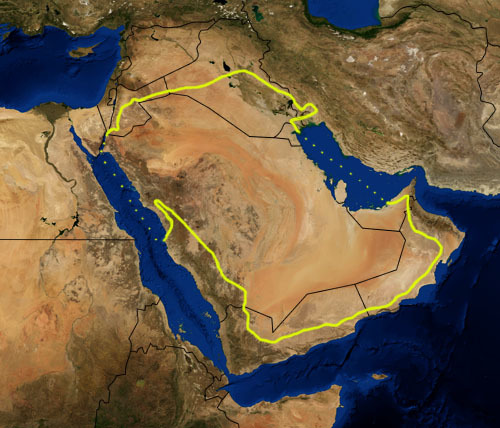 The yellow line encloses the ecoregion called "Arabian Desert and East Sahero-Arabian xeric shrublands", and two smaller, closely related ecoregions called "Persian Gulf desert and semi-desert" and "Red Sea Nubo-Sindian tropical desert and semi-desert". National boundaries are shown in black. Arabian Desert Facts for Kids. Kiddle Encyclopedia.